Residents of Koro Abili Trading Centre in Gulu on Tuesday morning blocked Gulu-Kampala high way for about five hours as they protested over the rising spate of accidents on the road. 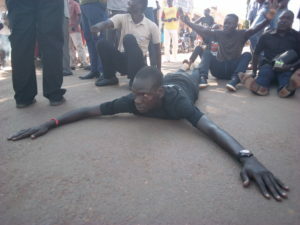 They kicked off with the protest at around 9:00 am local time following an accident at the trading centre, about 8 Kilometers from Gulu Town. Three people who were injured in the accident sustained broken limbs and injuries on their heads were rushed for treatment at Gulu Regional Referral Hospital. The angry residents used wooden logs and stones to block the road to traffic while some of them held logs and placards demanding immediate installation of humps. Justine Odong, the Koro LC3 Chairperson, said the trading centre has experienced at least seven accidents since the beginning of the year. He said some of the accidents have been fatal. It took several minutes for Peter Mugabi, the Omoro district Police Commander, to persuade the residents to call off the protest and allow traffic to flow. He told the residents that the driver of the vehicle has been arrested by Police. Peter Okello Douglas Okao, the Omoro District LC5 Chairperson also spoke with the residents to allow traffic resume. He asked the residents to open the road to traffic to allow UNRA assess the area for installation of humps.